A couple of months before their summer vacations in Puerto Rico, Emily contacted me because she would be proposing to Ana, and she really liked the idea of having her proposal secretly photographed. We planned, booked the space for the evening, and it was all set. Then, Ana proposed first! Weeks before their trip! So Emily happily wrote about the big news and we changed the concept from proposal photography to an engagement vacation session. Ana had endearing childhood memories of Parque de las Palomas, so that was where we started our photos. Parque de las Palomas, translated as Pigeon Park, is one of many Old San Juan plazas. What it makes this one unique is the fact that there's a brick wall that provides refuge to hundreds of pigeons that wait there every day for tourists to feed them. It's an iconic landmark of Old San Juan, and provides fun for kids and adults alike. My one recommendation would be to bring baby wipes, and be prepared: the pigeons will jump at you! It was a perfect ice-breaker for our photos. As a bird lady, I'm well acquainted with the fact that the way to a bird's heart, much like mine lol, is through food. So I bought some pigeon food from the vendors, and watch the frenzy happen! Emily and Ana braved the attack and we turned out with some beautiful photos that were so fun for me to capture! 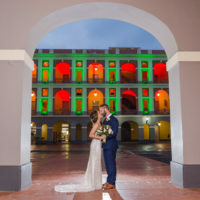 Afterward, we walked around the always beautiful streets of Old San Juan, looking for perfect places to photograph the couple. We were on a very laid-back vibe that day, so we took a break mid-session at Deaverdura, a local restaurant that doesn't have a fixed menu, instead they cook a variety of Puerto Rican food with local produce and ingredients available for the day. As if the session could be any better, we ordered passion fruit (or maracuja) juice, and two orders of tostones, one of my favorite sides made of fried plantains. We finished our portraits walking around El Morro Fortress. It was a perfect day.